I've been listening to Coast radio for a few years, and every so often this add would come across — 'Call Cochrane and Son logging if you have two hectares or more. We'll take your trees and turn them into money'. Recently at the work safe review in Whangarei, I sat at the same table as Keith (Cocho) Cochrane, a big man in every sense of the word, who has carved out of the logging industry a successful business cutting private forest owners' trees. It's no wonder Cochrane ended up in the logging business, as it was already in the pedigree — Uncle Brian Cochrane (now deceased), from the Central Plateau, was a tough, no-nonsense logging contractor through the seventies and eighties. I knew Brian Cochrane well — he logged huge volumes of minor species out of Kaingaroa. He was innovative and was always looking for a better and safer way to get the wood to the skid site. Cochrane had no choice when it came to joining the workforce — he was kicked out of school. As it happened back then, there was no unemployment and those that showed little or no academic skills were soon into a job, so Cochrane started his working life as an apprentice panelbeater. Once qualified, he started driving trucks part-time on weekends. This led to a full-time change of employment and for the next two years he drove stock and general freight around Northland. Cochrane was offered another job digging postholes, but he decided spades and postholes were not an option for him. At 22 years old, he bought his first chainsaw and started dropping macrocarpa trees for supply to the local Northland sawmill. The sawmill lent Cochrane a Zetor four-wheel-drive tractor to haul the logs to the landing. The Zetor was used to load trucks by par buckling — basically one uses a rope anchored at two points and a power source to roll the log up a set of ramps and on to the truck and trailer. Cochrane purchased a local sawmill for a while and eventually sold it to go logging full time. Expanding his fledgling logging business, he purchased a second-hand Case dozer, a 664 Clark skidder, and the good old faithful Hough 65 rubber tyre loader to supply the local Whangarei sawmills with pine and macrocarpa logs. 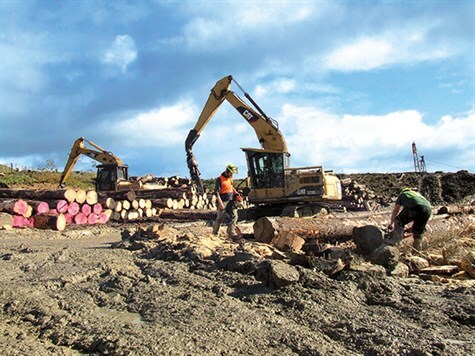 Cochrane has been supplying logs to Roswell's sawmill in Whangarei for over forty years and Croft poles for twenty years. Cochrane Logging today also supplies logs to Carter Holt Harvey, Marazumi pulp, and Pacific Forest Products with logs for export. 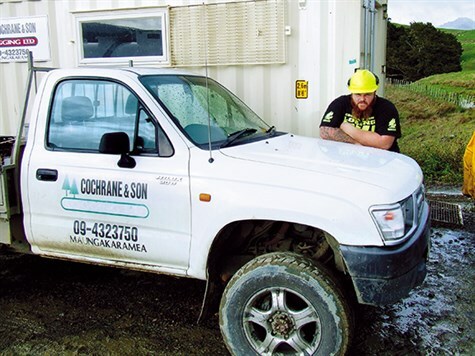 Cochrane was successful tendering for a New Zealand forest service contract and worked for them for six years with a ground-based crew until Roger Douglas introduced dramatic changes to New Zealand's economy and brought about the demise of this government department. Cochrane changed tack and focused on woodlot logging, becoming a specialist in this field. Cochrane and Son is very much a family business. Cochrane's sister-in-law helps with the office work and Grant (Grunter) Cochrane runs the logging crew. As with all family businesses, this arrangement came about by the young bull flexing his muscle and a dispute between father and son resulted in Grunter running the logging gang and Cocho negotiating the purchase of private forest and sales of logs from Northland blocks. Grunter, a chip off the old block, runs an efficient operation. Equipment used now is all tracked gear, as it found rubber tyre machines are not an option for logging in Northland. 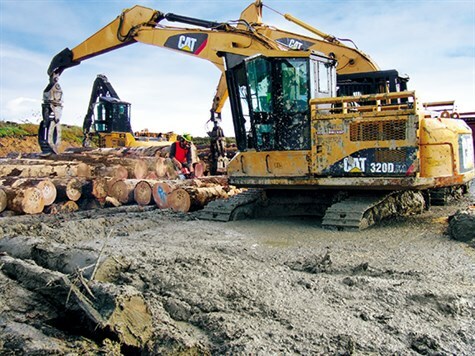 With three excavators fleeting and loading, a grapple skidder handy for the summer months, a D6D and Thunderbird 155 swing yarder, the operation is producing approximately sixty-five thousand tonnes of wood per year. It has an excellent safety record and, to continue to maintain it, the company will be introducing a grapple and camera to the swing yarder and hopefully a processing head within the next eighteen months. The Cochranes have just purchased three new logging trucks and these will be on the road soon hauling their own wood. The addition of the trucks gives the Cochranes complete control of their logging business and they'll be able to give the private woodlot owner better service, over and above the excellent service they have been getting. Cochrane and Son Logging has won an award for safety and Cochrane attributed the win to having a stringent safety training programme. "Everyone is responsible for everyone else and are encouraged to pipe up when things are not right," he explains. All the crew hold the forestry module qualification relevant to their job — Keith and Grant were the first father and son team to gain their national certificate in forest harvesting. Cochrane attributes his success to having good mentors in his early years, Uncle Brian Cochrane was always there for advice; Stan Semenoff (trucking), Peter Edlington (panelbeaters), and Maurice Brownlee (trucking), all helped make Cochrane into a successful logging contractor. The fact he, as a young man, could listen to the advice of his older peers is amazing, as most young people still want to try and reinvent the wheel. Progress would be so much faster if young people listened to their experienced peers, rather than work it out for themselves. Talking with Cochrane, you get the feeling there is a still a passion for the logging industry and after 42 years, it is as still as strong as ever. 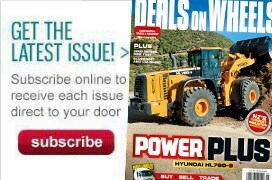 As with all logging contractors, they have their good times and bad. The Asian crises came close to putting this contractor out of business, but once a logger, always a logger — he came back fighting and survived. He does not envisage retiring any time soon and I guess that will come as a relief to many of his customers. Some woodlot owners have already had a second rotation crop cut by this reputable Northland logging contractor. With the younger Cochrane firmly entrenched into the family business, they will be cutting Northland pines for many more years to come.